InstaPic is a free Windows 8 Instagram app that lets you access Instagram in an intuitive way on your Windows 8 device, while offering all features you get on the official Instagram app. 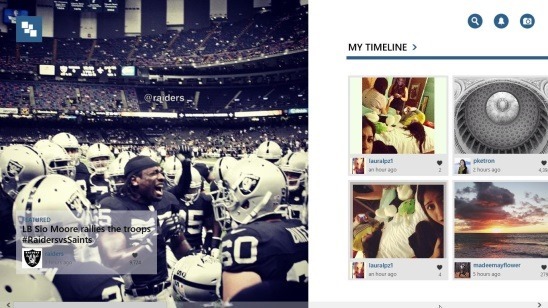 Since it’s a client app, it allows you to do everything that you usually do with Instagram. That is, you can post an image of yours, view your profile and photos you have uploaded, view, like, or comment on photos uploaded by your friends or followers, search for a particular users and view their information, view notifications, and connect the app with Facebook and Twitter. This free InstaPic app is available under the Photo Category in Windows Store. Instapic is one nicely made app for Windows 8. The app’s interface is very intuitive and beautifully designed. All the contents (basically latest images) are shown in big thumbnail size, along with the number of likes and the time it was posted. The app is totally functional and refreshes at regular interval of time, hence showing you the latest feeds. Once you launch and login with your Instagram credentials, you’ll be with the Main Screen of the app, which shows the one most happening image as the featured image in big size view. This is one of the good points that makes InstaPic an attractive app. Besides that, you’ll find My Timeline and Popular categories in the Main Screen. My Timeline display posts made by the people who follow you and people whom you are following. 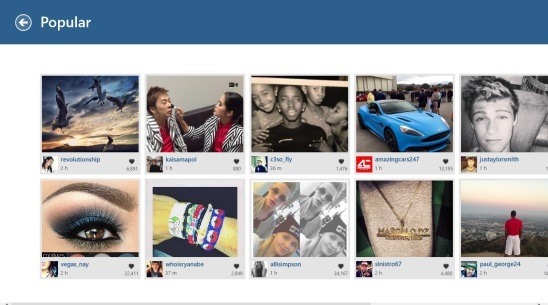 And Popular category contains the most popular posts made by other users of Instagram. Clicking on a post (image/video), opens that post in a sub screen on top of the Main Screen, highlighting only the Sub Screen by fading out the Main Screen contents. From here you can like, make a comment, share with Facebook and Twitter friends, or email that image or video to a friend. You can also follow the person who made that particular post, if you are not following him/her already. Plus, you can switch between other posts of same category by using the previous and next buttons. Another good feature of the InstaPic app is, you can see all notifications by simply clicking on the button having a bell design on the top right side of screen. This is a very well thought idea. There are two more buttons in the same corner; one for Upload and other for Search. 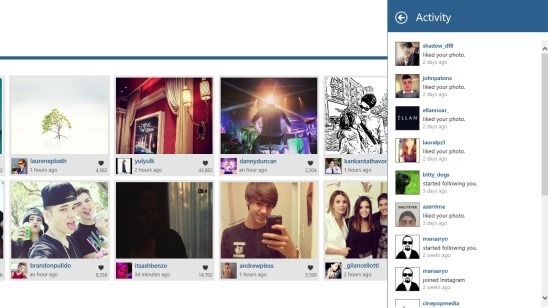 Search helps in finding an Instagram user, while Upload is for uploading images or videos. You can also make a search by Right clicking on any screen; this opens a flyout on the top which has Home, Profile, Search, Find Friends, and Refresh Buttons. 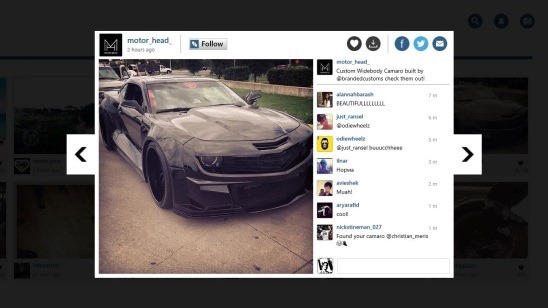 Remarkably a good Instagram app for Windows 8. Shows posts in Featured, My Timeline, and Popular categories. View activities related to your profile through notifications. View, upload, like, and comment on posts. Share posts with Facebook and Twitter friends. Pin users to Start Screen. Search by user or tags. InstaPic is a well thought and well made Instagram app for Windows 8. It’s functional, does what it advertises, and has a really good interface. 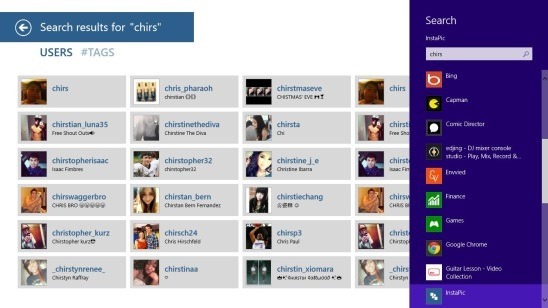 It’s quite different from the other Instagram client apps for Windows 8. It didn’t keep things in their original form, rather it brings a change, which is good and admirable. Above all it’s all for free.